January 31, 2018 (Tony Cartalucci - NEO) - The tentative first beginnings of a long-awaited US-backed color revolution has begun in Thailand, with a small protest of under 100 protesters in the downtown district of Thailand's capital Bangkok. Image: Media outnumbers "protesters" in downtown Bangkok nearby the scene of previous protests in which similar US-backed mobs fought gun battles with troops before burning sections of the city down in 2010. The protesters seek to overthrow Thailand's independent institutions including its military and constitutional monarchy, and return US proxies to power, particularly billionaire and former prime minister, Thaksin Shinawatra and his Pheu Thai Party (PTP). Thaksin Shinawatra is a convicted criminal who fled Thailand to evade a two year jail sentence and a myriad of court cases still pending trial. In essence, US-backed protesters seek to return a fugitive to power by proxy, a similar scenario to 2011 when Thaksin Shinawatra's sister, Yingluck Shinawatra, openly ran as his proxy in elections his political party won. 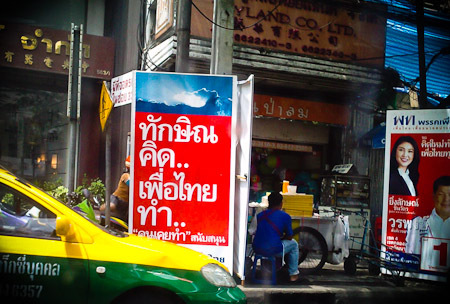 The 2011 campaign slogan, "Thaksin Thinks, Pheu Thai Does" openly flaunted the extralegal nature of PTP's bid for office. 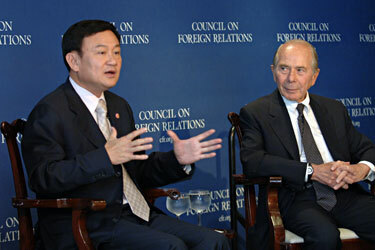 After assuming power, senior PTP members would regularly leave Thailand to consort with Thaksin Shinawatra in person, further highlighting the fact a convicted criminal and fugitive was running Thailand's government rather than his nepotist appointed sister - a fact either omitted by Western media reports, or excused. Image: A 2011 PTP campaign poster claims in Thai, "Thaksin Thinks, Pheu Thai Does," an open admission that a convicted criminal and fugitive hiding abroad openly runs a political party attempting to contest elections. By 2014, after over half a year of protests and the collapse of PTP's rice subsidies it used in 2011 to lure voters, the military once again staged a coup and ousted Yingluck Shinawatra from office. Since the coup - Yingluck Shinawatra, like her brother - has been convicted of corruption and sentenced to 5 years in prison. She too has fled Thailand and joins her brother in exile as a fugitive. Despite a political party run by convicted criminals and fugitives, Western diplomats and a collection of faux-activists they fund and organize in Bangkok demand expedient elections in which Thaksin Shinawatra's Pheu Thai Party will still run in and will likely win. Elections have been repeatedly delayed precisely to prevent this scenario from happening, with each delay designed to give the government more time to diminish the power, wealth, and influence Shinawatra and his foreign backers still wield to grant themselves impunity from the rule of law. The Western media has intentionally covered up the true nature of Thailand's protesters, just as they have done throughout other US-organized regime change campaigns around the world from the so-called "Arab Spring" in which "pro-democracy activists" turned out to be members of extremist groups including the Muslim Brotherhood and even Al Qaeda, and in Ukraine where "Euromaiden" mobs were led by literal Neo-Nazi fronts, particularly Svoboda. 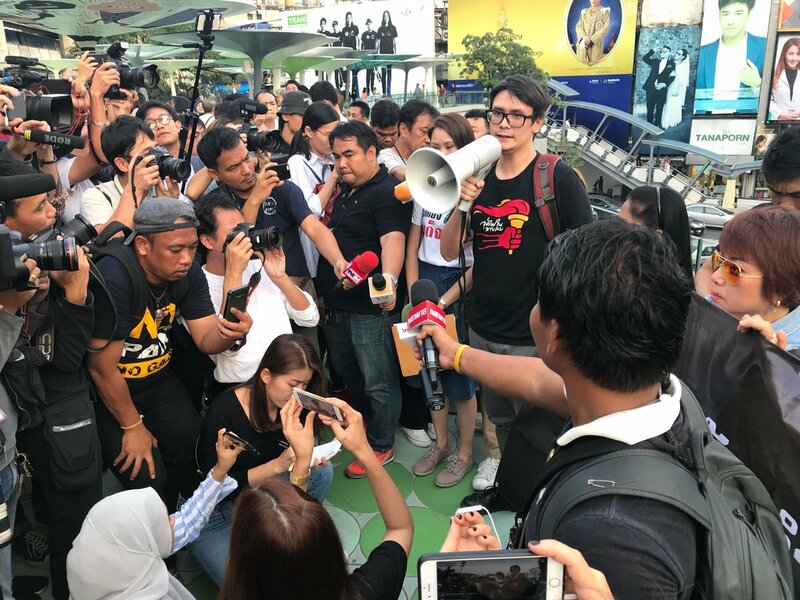 Admitting who Thailand's supposedly "pro-democracy activists" are would immediately dash the nascent protest's legitimacy against the rocks of international public opinion, which is precisely why the Western media is intentionally mischaracterizing the protests. In 2014, the day after the military officially removed Yingluck Shinawatra from power, the US Embassy in Bangkok helped organize the creation of the Thai Lawyers for Human Rights (TLHR) front. 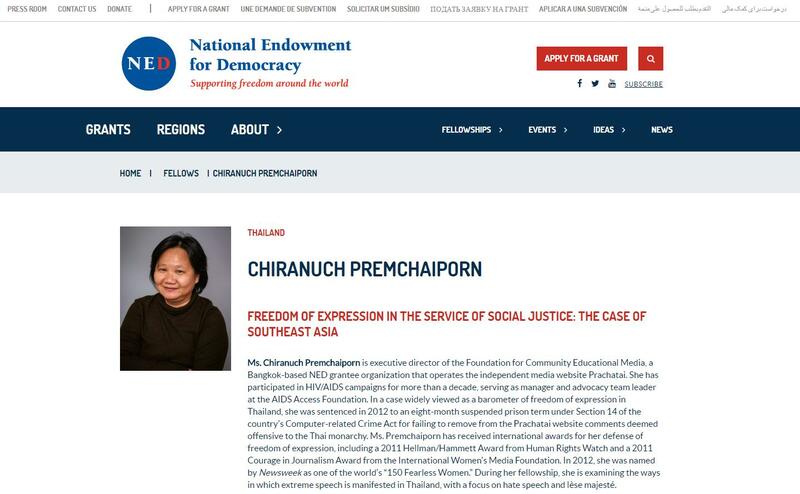 Funded by the National Endowment for Democracy (NED) - appearing on NED's Thailand 2014 list - the front is one of several components of Washington's regime change machinery in Thailand. TLHR head Sirikan "June" Charoensiri has repeatedly posed in pictures with foreign embassy staff on her way to face questioning regarding her foreign-funded activity. In many instances, foreign embassy staff will actually accompany her - and other recipients of foreign funds - to police stations in a sign of open support for their ongoing sedition. 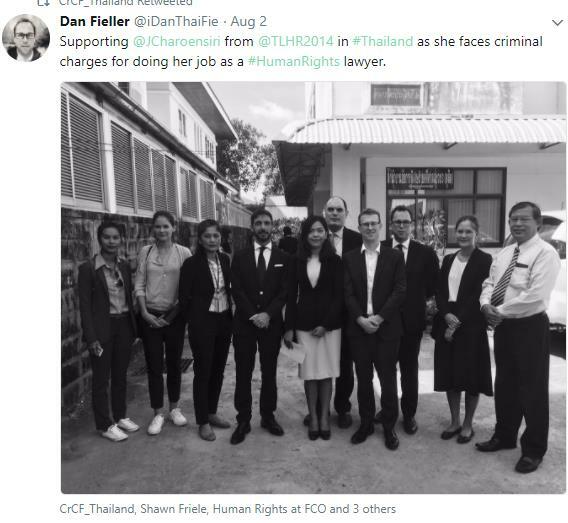 Fieller and others, including Charoensiri herself, have refused to respond to multiple questions concerning the conflict of interest of posing as human rights lawyers while receiving foreign funding and representing foreign interests unrelated, even opposed to real human rights advocacy. This is particularly so when considering those these "human rights lawyers" are defending and the fact that they are supporters of Thaksin Shinawatra, his political party, and his street front, the so-called "red shirts" who have regularly resorted to intimidation, violence, mass murder, and systematic terrorism which included the bombing of a hospital just last year. Like in Syria and Libya where crackdowns on overt terrorism were condemned by Western governments, Western media, and Western funded fronts posing as nongovernmental organizations (NGOs), the West is hiding a violent movement and its supporters behind the thin veil of "democracy" and "human rights" advocacy. Also funded by the US government via NED are media fronts like Prachatai, the Cross-Cultural Foundation (CrCF), and the Isaan Record. All three have repeatedly covered up their foreign funding, refusing to disclose it to their readers, at other times denying it, while still at other times attempting to dismiss any sort of conflict of interest regarding receiving foreign funds and representing foreign interests through their so-called "journalism." Despite denials and deflections regarding US funding, all three platforms are openly listed as NED recipients on NED's Thailand 2011 and Thailand 2017 lists. In addition to Prachatai's extensive NED funding, its "executive director" Chiranuch Premchaiporn is also officially an NED fellow. And while the actual protest leaders themselves - including Sirawith Seritiwat and Jatupat "Pai Dao Din" Boonpattararaksa of the "New Democracy Movement" and Rangsiman Rome of the "Democracy Restoration Group" - have not disclosed financial support provided to them by foreign governments, they openly consort with, receive political support from, and eagerly represent the interests of foreign governments - particularly the US, Canada, the UK, and the EU. Like June of TLHR - these protest leaders regularly pose for photographs with foreign diplomats, and regularly receive direct support from them when facing legal charges. 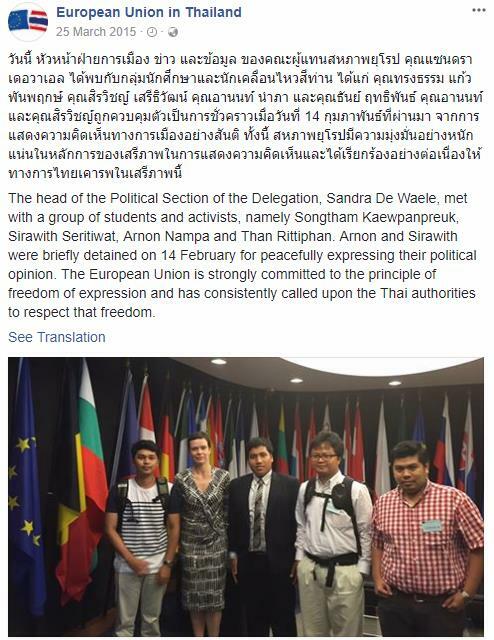 The EU delegation regularly and very openly supports and collaborates with pro-Shinawatra supporters posing as "activists." When Shinawatra's supporters attacked anti-Shinawatra protesters in 2014 with assault rifles, hand grenades, and 40mm M-79 grenade launchers, Western diplomats were either entirely silent, or worse, attempted to defend the violence as mere expressions of "frustration." Honoured to meet with parents of Pai Dao Din. 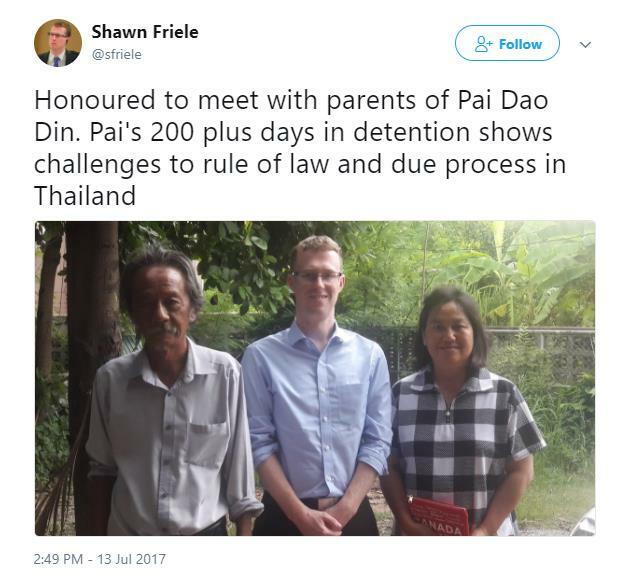 Pai's 200 plus days in detention shows challenges to rule of law and due process in Thailand. 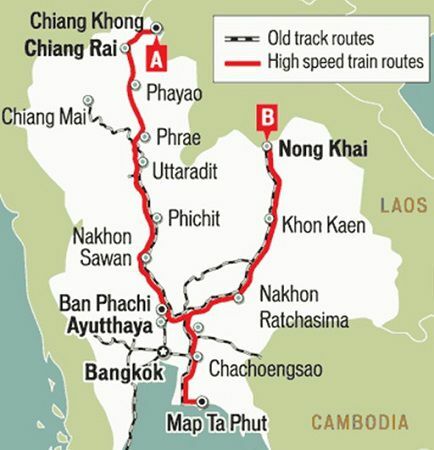 Rangsiman Rome, in addition to allegedly seeking "democracy," in no coincidence attempted to pressure the current Thai government regarding rail project deals being struck with Beijing that the United States also wants delayed or entirely disrupted. 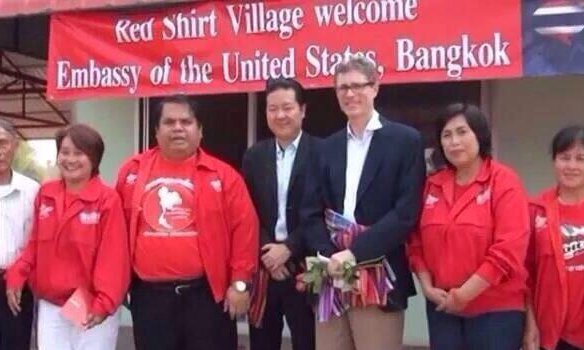 Before creating this latest collection of proxies, Western embassies including representatives from the US, openly provided support to Thaksin Shinawatra's previous street front, the United Front for Democracy Against Dictatorship (UDD) better known as "red shirts." The UDD has suffered a crisis of legitimacy after committing serial acts of mass murder and terrorism. Despite having "redressed" the UDD for this latest push for regime change, many protesters can still be seen wearing their red shirts to events. While the thin pretext this collection of faux-activists and NGOs is "democracy" and "human rights," it is clear that they serve as an extension of Western influence in Thailand. While they demand "elections," it is clear that they merely demand elections they are confident will return Western political proxies like Shinawatra and his PTP to power. And in addition to demanding regime change, these proxies are also openly assisting the US in attempts to disrupt growing ties between Bangkok and Beijing, serving Washington's interests, not Thailand's. The "activism" of supposedly "pro-democracy" groups funded and/or backed by Western governments in Thailand are already openly questioning, condemning, and actively seeking to disrupt these ties. Once considered a stalwart ally of the United States, since removing Thaksin Shinawatra from power in a 2006 military coup, the Thai establishment has begun a sweeping shift in foreign policy, replacing its aging arsenal of US military hardware with Chinese, Russian, and European equipment, including hundreds of Chinese tanks and armored personnel carries and even Chinese naval vessels including the nation's first acquisition of submarines. 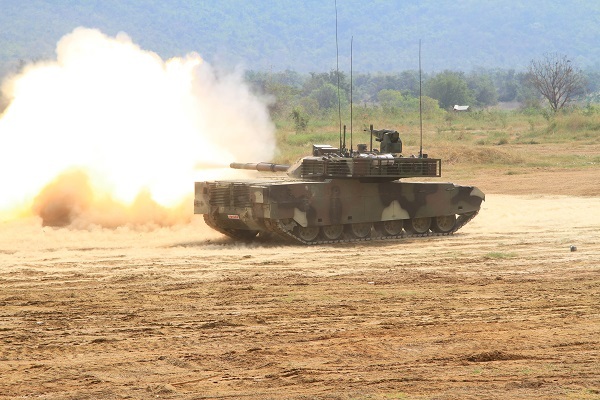 Image: A Chinese-built VT4 main battle tank conducts exercises in Thailand's Saraburi province. 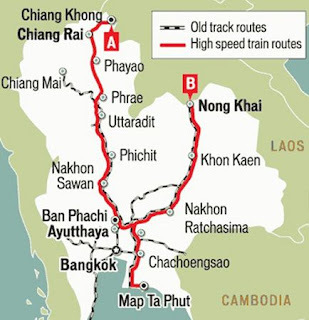 Bangkok has inked deals with China regarding metro rail systems as well as national rail networks including high speed rail systems that will connect not only Thai cities, but connect Thailand to its neighbors to the north and south, and to China's Yunnan province. Thailand has also begun conducting joint military exercises with China, balancing what had been for years Washington's exclusive domain represented by its annual Cobra Gold exercises. Under Thaksin Shinawatra between 2001-2006, Thailand pursued a decidedly pro-US foreign policy, which included sending Thai troops to participate in the US invasion of Iraq in 2003, the hosting of the US CIA's rendition program, attempts at sealing a US-Thai free trade agreement without public or parliamentary support, and the selling off of Thailand's nationalized natural resources to Western oil corporations. 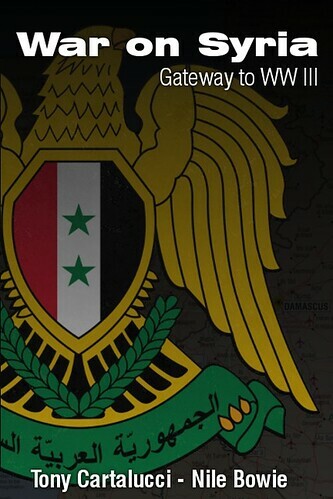 It is clear that the United States would like to return to such an arrangement. After providing over a decade of support via Washington's largest lobbying firms, allowing Shinawatra free travel across the US and Europe despite his criminal conviction and his status as not only a fugitive, but as a human rights violator, and the mobilization of the Western media in support of Shinawatra's multiple bids to seize back power - it is clear that should Shinawatra or his proxies ever return to power, they have an immense debt to Wall Street, Washington, London, and Brussels to pay back. Part of repaying the West - including for the current color revolution the US is attempting to organize in Bangkok - will be reversing growing ties with Beijing. 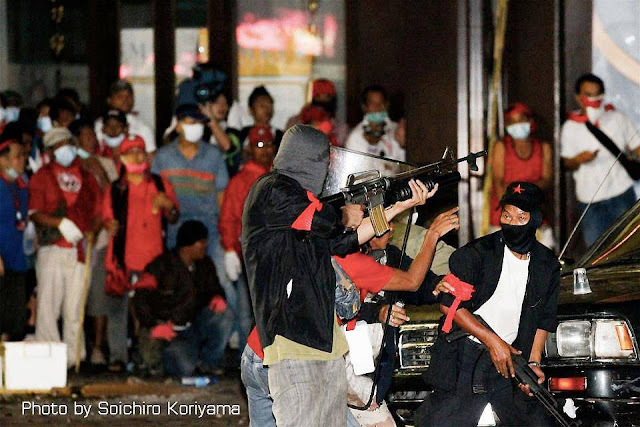 Image: This stunning image taken during Thaksin Shinawatra's UDD "red shirt" protests in 2010 shows the first shots fired during what would end up being weeks of gun battles between armed terrorists and Thai troops in Bangkok's streets. The violence ended with nearly 100 dead and the UDD carrying out widespread arson costing property owners billions in damages. Since then, the UDD has carried out a campaign of sporadic terrorism and has threatened to wage "civil war" to seize power. While current protests feature supposedly "student activists," it is clear they are merely rebranded UDD "red shirts." The longer these protests continue, the more difficult it will be for the Western press, Western embassies, and their collection of faux-NGOs to cover up the nature of who is leading them and why. Over this period of time, the government and media can begin exposing and undermining the credibility of claims these protests are "pro-democracy" and not merely foreign funded mobs seeking to place a party run by Shinawatra - a fugitive hiding abroad - back into power. It will also be difficult to sustain the protests without expending larger amounts of money and resources and thus exposing those financing them. While the alleged protest leaders pose as "students" and "independent activists," it will become abundantly clear that large well-financed interests are really organizing and sponsoring them. In this scenario, the government may simply give the protest the time necessary to destroy itself while continuing to fulfill its pledge to delay elections as long as necessary to carry out reforms - in other words - make it impossible for Pheu Thai to win elections as long as Shinawatra - a fugitive hiding abroad - openly runs the party. The second scenario is where elections are eventually held, and if Shinawatra's proxies come back into power, Thailand's institutions patiently wait for the government to once again misstep and provoke protests, and once again invite the military to intervene. With each intervention - while there carries a variety of risks - the military has successfully cut down Shinawatra's political power and influence while exposing the role of Western interests meddling in Thailand's internal political affairs. In the case of either scenario, one factor remains constant - the rise of China and with it the rest of Asia. Each passing year marks a decline in US regional primacy and a more equitable balance of regional power driven by Asia's interests, not Washington's. In either scenario, as long as Thailand's independent institutions avoid a major misstep and patiently and carefully deal with Western-backed subversion, the shifting dynamics of geopolitical power in the region will eventually make Western-sponsored regime change altogether impossible. However, with the prospect of regime change taken off the table as an effective tool of coercion used by the US, Thailand is likely to suffer greater incidents of terrorism, as seen in 2015 during the Erawan Shrine bombing carried out by Uyghur terrorists linked to NATO's "Grey Wolves" militant organization. 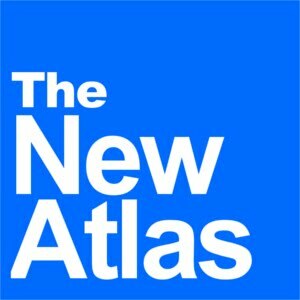 Western-funded faux-NGOs are already increasingly shifting their attention toward Thailand's ongoing turmoil in its deep south, attempting to leverage the isolated conflict into a national crisis used to divide and destroy the nation just as Western interests are doing in neighboring Myanmar. US color revolutions depend on widespread public ignorance, lightning fast chaos, and inexperienced governments unable to cope with the instability and eventually violence the US uses to pursue regime change. Thailand's government has had plenty of time to contemplate its strategy with examples around the world of how to successfully defeat US-backed subversion, and how not to. Only time will tell how much Thailand has not just learned, but mastered in repelling this type of geopolitical attack.